Hi Stefan Here I am at home with my Avensis. Collected it from the border 600 I'm away..
got in started it & it drove like a dream VERY happy. Thank you SO MUCH for all your patient assistance. remember , i am here to support, if you need another just let me know. We really appreciated every single moments doing business with you. We keep in a touch!! When you want to buy the car, please contact me anytime. Thank you very much the car has arrived as was on the web. I will introduce Cardeal page to my friends to purchase from you. Keep them rolling. Thank you very much for your purchase with us. We are very happy to hear that. I am fine and happy because,i received my car in good and excellent condition.I also have a test drive 2491 km from dar es salaam to harare,without any problem as I had last time,when i use another ex japan car exporter(which well know its name is .................). I am sure to keep on dealing with you and encourage my friends to trade with you. Great and many thanks to Koki Kato for the relaible agent he give me.But you forget to provide me with a promotional goods to advertise your organization. I’m so glad to hearing about receiving your vehicle in very good condition. We are continuing to ship the best condition vehicles so please keep on dealing with us. Also, please let us know if your friends are looking for any vehicle. We will offer good cars for your friends! i dont know if this will get to you but if it does thank you so much for the car it arrived safely and i Like it its a good deal keep it up will commend my friends too you directly and indirectly many are already tracking yor page its cool thanks Happy customer. Maturure Abednego. Yes I received the car. I had responded to Inacio. I was so happy that instead of buying an SUV as I had mentioned earlier to Inacio I am now currently discussing with him for the purchase of two smaller cars: Another Mercedes Benz C200 Kompressor and Volvo S40. Regards the car I received it on the 27th of August. The car was just as advertised. There were no hidden information nor surprises. The interior was exceptionally clean. The fabric of the seats as good as new. The performance awesome. My wife enjoyed it so much that is why am ordering another one. This one was for my mother. We are presenting the car to my mother this weekend on Saturday. The Mercedes Benz is a great present for your mother, I am sure she will like the car. I am very happy to hear that you will purchase 2 more cars in October. I will be here to assist you. Thank again for being such a good customer. Thank you..we have received the car in good condition. Thank you Osada for the great service. Thank you very much for sending us your photo! We don’t have many photos from Zimbabwe, so your photos makes a very welcome addition to our collection! Please let us know if you need more vehicles from Japan. We are very keen to return the gesture by offering you a very good deal once again! I want to express my gratitude for all your assistance when purchasing my car. I received my car last night and am now at home with it. Good day to you guys from Yamagin Corporation and am happy to thank for the car that bought from you. Thank you once again, my family happy with this new car and I would not hesitate to recommend my friend to purchase vehicles from your website. I wish you a happy year of 2015. I would like to express my profound gratitude you guys for the exceptional quality of service you rendered to me. My family and I just love the car that you sold us. We drove it for the 2700km journey from Tanzania to Zimbabwe being not so sure as to how it would perform, but it out performed us. The engine is close to new , no temperature fluctuation, the tyres still good, the emissions no problems, the lights, you name it, all was in order. If get money for another car again, you will my port of call. The man Yunus Jones, you just good and honest my friend. The communications (Skype,emails, telephone calls), very detailed and on time. Thank you very much for your very warm words. I am very happy that you received the car in good condition and drove it safely for 2700km. Hope we will do more and more business together with you or with your friends/colleagues. Let`s keep in touch, I will do my best to maintain our friendship forever. Thanks for the communication. I do hope you got the completed form. Thanks once again for making it possible for me to purchase a car from your company. I am really having a GREAT time driving it and its so convenient considering the amount of travelling I do from one point to another on my job. The car is like a companion to me. Well done for providing such services. Thank you very much for your message and kind updates. We are confident that you will be happy with it for a long time. Please take 1-2 photos with your car and send us by e-mail. It will be a proof for other new customers showing we are a real supplier. thank you very much for your trustworthiness. i received my vehicle in a condition far better than i expected it to be. i am very satisfied with all my vehicles that i sourced from cardealpage . i have also started recommending people to get into contact with your friendly and cooperative staff when they need vehicles. once again thank you very much with special mention to mr Yunus for his unwavering guidance and support. please find attached images of myself and my wife posing behind the vehicles we bought from you. It was a great honor to deal with you. Especially your supports to other new customers. We are very thankful to you for all you did and doing for us. I received my vehicle in good condition. I was very much afraid since this was my first time to purchase a vehicle through the internet. I was relieved when my agent phoned and asked me to collect the vehicle at Beitbridge boarder post. Well done guys for the good work. Thank you for your picture! You look great in front of the vehicle you purchased from us, and what a cute little daughter you have! Please come visit us in Shinjuku/Japan if ever you find yourself in Tokyo. We would love to take you and your daughter out for drinks. We have received your vehicle and after doing a mechanical inspection on it, we found it to be in very good condition!!! Please know that we will be in touch in the future with any new vehicle inquiries! God Bless and once again thank you very much for your HONESTY! Thank you very much for your message and photos of the car. I was confident that Ms. Paula Bortolan will love the car because of it`s condition. Please do not hesitate to cotact us again if you or your customers need non-accident history, first hand used Japanese cars. Look forward to do more and more business with you. This letter serves as a follow-up to my purchase of the vehice from your company in October 2013, a Honda CR-V. Let me frankly state that I was very happy about the condition of the vehicle. It was in the condition specified on your website and almost as new upon driving it, as confirmed by my young brother and wife. Thank you for your valued service. This is a long-term business relationship that we have created through fair deal. Find attached the vehicle and my wife, happy to have it. I am very pleased to read that you and madam liked the car very much. I am sure your car will serve you for a long time without any fail or problem. 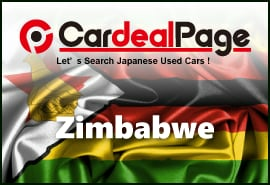 Please keep watching CardealPage.com for daily updates. If anyone asks you to help with buying car just let us know. I am a proud owner of s car bought from Cardealpage. Try them and you will never regret it. It's a real car deal! We promise to develop our service further more and supply only & only excellent condition cars to customers. Your trust and your final satisfaction is the main purpose for all CardealPage Team. I am happy with the condition of the NISSAN CIVILIAN bus I purchased from you. It is performing excellent and I am sure to do more business with your company. It is a great pleasure to do more and more business with you. Your friends are purchasing from us. And a lot of other customers sending us e-mails saying that you were very helpful to them. And they are buying from CardealPage without any hesitation. We hope that your good business relation with CardealPage will remain forever. Thank you for being our friend-supporter. Mr Yunus, I thank you very much for being honest, faithful, Trustworthy and for the wonderful service you offered to me. I picked up the vehicle myself from Dar es Salaam (Tanzania) and drove it to Zimbabwe without any problem. The vehicle is still in very good condition. In fact, its as good as new. I would also want to thank you for some other vehicles which i previously purchased from you (CARDEALPAGE), the vehicles are still good as new. Please keep up with the best services. I am sure your vehicle will serve you for a long time without any fail or problem. We are grateful to both of you for your constant supports and advices. As a sales team of CardealPage we will do our best to develop our service to much better level. Please keep in touch with us! I have received my car through CardealPage.com. I go a 5 Star service from this guys it was excellent . I am very have with them. Everything was intact even my family were very happy too. We appreciate sending us the photo of your Benz and yourself. You will enjoy driving it and it is what we hope for. Neat car is what we want to sell to our customer. For that purpose, we inspect car conditions carefully before we purchase them. We are glad that even your family is happy about your Benz. Thank you very much CardealPage for the professional service that you provided when I bought the Nissan Atlas from you. It is in good condition and performed very well on the 2700km drive from Dares Salaam to Harare in Zimbabwe. the Engine is in good condition and my family was happy to receive the truck. I will definitely recommend some of my colleagues to buy from you. We were glad to provide you the service in your purchase. The ride from Dar es Salaam to Harare must have been very tiring. But, it is delightful to hear the truck is working well for you. We choose trucks that can last for long time for customers' use. 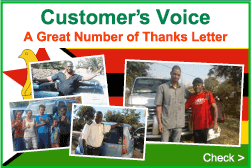 Your work as our customer support agent in Harare is much appreciated in our company. Ce processus implique beaucoup de paperasse et de compréhension de la procédure de compensation voiture entière. City Delivery Service vous donnera l’occasion de recevoir votre véhicule sans tracas et en toute sécurité à votre adresse. Vous pouvez nous en remettre à votre ville! En cas de livraison à PLUMTREE, BEITBRIDGE & CHIRUNDU via DURBAN, nous vous recommandons de payer les frais de dédouanement et d'importation avant de recevoir votre véhicule.Véhicule sera livré à l'endroit spécifié. 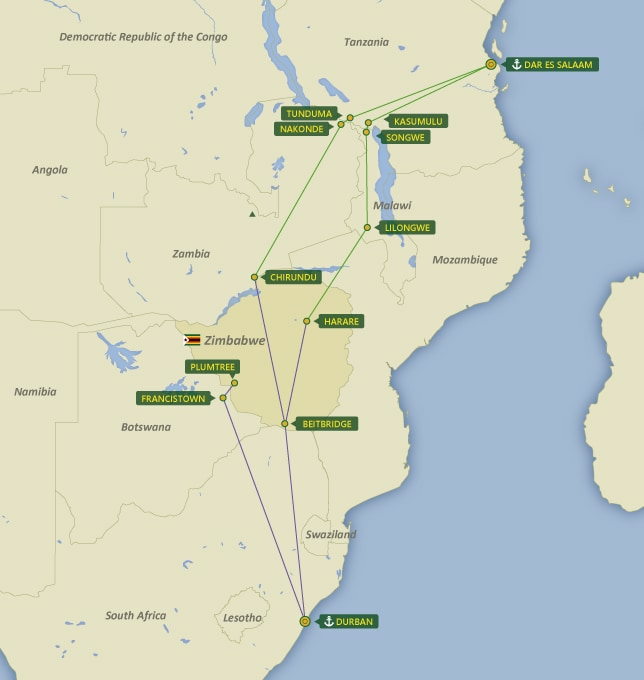 En cas de livraison à Harare via DURBAN, les frais de dédouanement doivent être payés avant d'entrer dans la frontière du Zimbabwe. SERVICE de LIVRAISON de la VILLE! CardealPage s’occupera de tous les papiers. Cela signifie qu’il vous épargnera les tracas ainsi que l’argent de la nécessité de transmettre les documents de votre côté. En outre, CardealPage est en mesure de vous offrir un service de fret intérieur (City Delivery Service) à des tarifs très raisonnables. Pas besoin de quitter la maison sur un long voyage pour récupérer votre véhicule au port! Vous pouvez utiliser City Delivery Service pour le livrer à votre ville! CardealPage vous donnera des mises à jour en direct et fréquentes sur l’emplacement de votre véhicule. Tout vol, accident ou endommagé pendant la livraison est couvert, vous pouvez simplement vous asseoir et vous détendre!